An Aquatic Digimon that has a long, serpentine body. Using its long body, it wreathes itself around enemies that are coming to attack, and constricts until the enemy suffocates. Naturally, it doesn't have intelligence or speech, and it swims around the Net Ocean leisurely according to its instincts. Its Special Move is breathing absolute zero air out of its mouth, instantly freezing water and firing it at the opponent (Ice Arrow). Its body has specialized solely for swimming quicker underwater, and its sense of smell underwater has developed further. Although it does not approach anyone bigger than itself, it sniffs out injured Digimon far off in the distance and attacks them. Rather than its intelligence, its instincts, which it acquired through its struggle to survive, appear strongly. 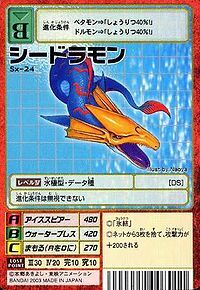 Its Special Move is breathing absolute zero air out of its mouth, freezing water and continuously firing it at the opponent (Ice Spear). 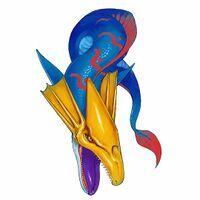 Its sense of smell underwater has developed, and it sniffs out injured Digimon far off in the distance and attacks them. 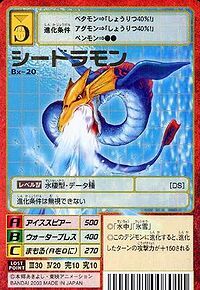 Special Move: Breathes absolute zero air out of its mouth, freezing water and continuously firing it at the opponent (Ice Spear). Ice Spear  アイススピア Aisu Supia Discharges a breath of absolute zero-temperatured water, which freezes the enemy solid upon contact. 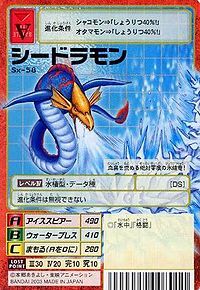 Seadramon X-Antibody appears only in the booklets of the manga. Can evolve from Agumon X-Antibody or DORUmon. 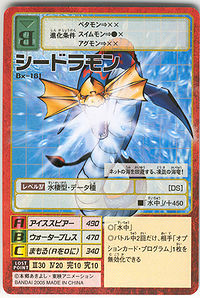 Evolves to Mega Seadramon X-Antibody or Okuwamon X-Antibody. This absolute-zero freezing dragon is out for blood! 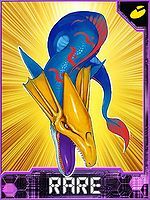 This freezing sea dragon circles the Net Ocean!